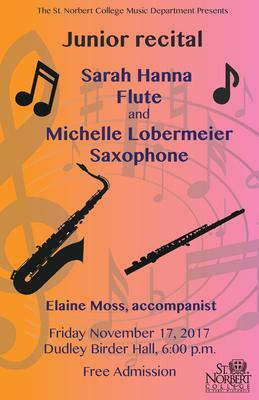 Michelle Lobermeier’s recital is in support of the Music Liberal Arts degree. Michelle is from the studio of Dr. John Salerno. Sarah Hanna’s recital is presented in partial fulfillment of the requirements for the Bachelor of Instrumental, Choral and General Music Education. Sarah is from the studio of Dr. Kortney James. St. Norbert College Music Department, "Junior Recital - Sarah Hanna and Michelle Lobermeier" (2017). Music Performances. 36.